First and foremost, let’s start with the important things. If you are going to be in Perugia during the month of October, you have to experience Perugia Eurochocolate 2019. The third biggest chocolate festival in the world where you can taste chocolate, check out chocolate sculptures and watch cooking shows, among other things. Only plan on being in Perugia for a short period? There are a couple of ways to do this. There’s the more economical version which will take up less of your time or you can add some museums and monuments in Perugia, Italy into the mix which might call for some more time dedicated to this capital city of Umbria. Stroll down Corso Vannucci and take in the cafés, bars and shops. Fuel up at Sandri dal 1860 and get a cappuccino and a pastry. Hit Piazza IV Novembre and hang in the piazza (if the weather permits). It’s great for people watching and taking in the history you’re surrounded by – San Lorenzo Cathedral and Palazzo dei Priori. Go up to Porta Sole for the best view of Perugia and its surrounding hills. Grab a porchetta sandwich – something Perugia is famous for. End with an aperitivo with the rest of Perugia at the Mercato Vianova. Perugia Archaeological Museum – This Perugia museum Umbria is located in Piazza Giordano Bruno here you will find pre-historical and Etruscan-Roman collections from the 19th century. A good example of a Perugia Etruscan museum. Perugia National Museum – This national gallery is the main Perugia art museum in the city and has one of the most substantial collections of art from the middle ages and Renaissance in Italy. Perugia Chocolate Museum – The Perugina chocolate factory opens their doors everyday so that you can experience the Perugia Choco tour. With this comes a tour of the factory, how its made and of course an ample sampling of chocolate, most specifically their Baci (kiss in Italian). Perugia Cathedral Museum – Here you can view its Gothic style interiors dedicated to Saint Lawrence and its many pieces of art inside. For discounts and easy access take a look at getting the Perugia City Museum Card. When all is said and done, check out the restaurant Museum: Perugia locale for live music, good food and great drinks. Hopefully by now you have a good idea of what to do in Perugia but check out the Perugia day tours below. We’ve included everything from a walking Perugia city tour, Perugia bus tours, bike tours, wine and food tours and more. Perugia Food Tours – here you will start at breakfast and end at aperitivo. Tasting everything from pastries, wines, popular Perugia foods and more. Top Perugia Wine Tours – Here you will experience the wines of the region of Umbria. Creating 26 million gallons of wine per year, you will get a taste (literally) of their vineyards placed in the Umbrian hillsides. Enjoy the white wines that they are best known for. Perugia Walking Tours – Check out these walking tours Perugia, Italy and experience the history in an easily walkable city. Perugia Self Guided Tours – feel like braving it on your own? Check out these self guided tours that you can follow from your phone at your own pace. Perugia Guided Tours – What’s easier than having a day set up for you along with a Perugia tour guide feeding you all of the history. Perugia City Tour Bus – these buses aren’t the usual ones you see around Rome or NYC but they will take you all around to the important sites and allow you to get off and on as you please. Bike Tours Perugia – Rent a bike – Biking tends to take place more on the outskirts of Perugia, throughout the beautiful hillsides. If this interests you, you can rent a bike and check out the different routes to take. 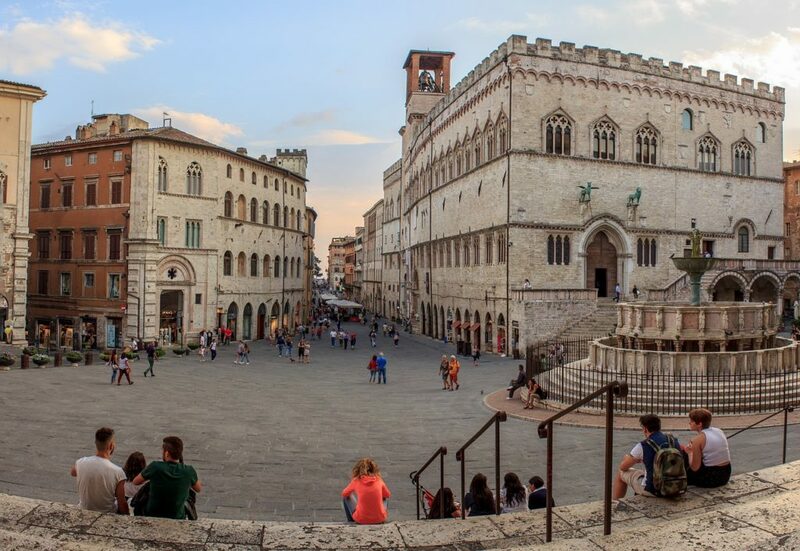 Perugia Tour Città e Tesori d’Arte – Taking us back to the main historical center of Perugia, with this tour you will see all of the main monuments of Perugia along with the National Gallery and conclude the day with an aperitivo. Don’t forget about our Perugia Chocolate Tours that we’ve mentioned above! For vacation rentals in Perugia, Italy, Perugia holidays rental, Perugia Eurochocolate accommodations and long term rentals, click here.